By Michael McCann, Ph.D., C.I.H. In order to protect yourself fully from the dangers of working with a hazardous material, knowledge of its properties and known health effects is essential. In most cases, the label on a product does not provide sufficient information for its safe use. 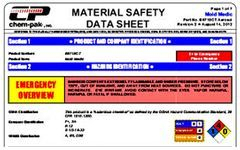 Material Safety Data Sheets (MSDSs) are a source of information on product hazards. A manufacturer or importer of a hazardous product must provide distributors and other commercial customers with MSDSs, upon first purchase of a hazardous product, and if the MSDS changes. Distributors of hazardous chemicals must automatically provide MSDSs to commercial customers. MSDSs are not required for non-hazardous products, although many manufacturers of art materials provide MSDSs for their nonhazardous products, with a statement saying the product is nonhazardous. Although self-employed artists are not legally entitled to MSDSs, responsible manufacturers will send them to all customers. Manufacturers are not required to use a given format for MSDSs as long as all the required information is present. The MSDS must be in English and must have no blank spaces. The following gives information on what must be contained in the various sections of a MSDS. The identity of the product should be the same name as found on the product label. The MSDS must have the name, address, and telephone number of the chemical manufacturer, importer, employer, or other responsible party preparing the MSDS who can give further information on the product hazards and emergency procedures. It must also give the date of preparation of the most recent version. This must include the chemical and common names of hazardous ingredients. For mixtures that have been tested as a whole, only the ingredients found to be hazardous must be listed. If the mixture has not been tested, all toxic ingredients at a concentration greater than 1% must be listed, and all carcinogenic ingredients at concentrations over 0.1%. Materials are considered hazardous if they are listed in OSHA's Z list (29 CFR 1910, Subpart Z, Toxic and Hazardous Substances), if the American Conference of Governmental Industrial Hygienists has assigned a Threshold Limit Value (TLV) to the material, or if it has been found to be toxic, carcinogenic, irritating, sensitizing, or damaging to certain body organs. The MSDS does not have to list the percentage concentration of each ingredient. This section must also have the OSHA Permissible Exposure Limit (PEL), the ACGIH Threshold Limit Value (TLV) or any other exposure limit used by the manufacturer. The one exception to listing the chemical names or common names of hazardous ingredients, according to OSHA, is if the manufacturer claims and is able to document it is a trade secret. In this case, the manufacturer must state on the MSDS that the identity of ingredients is a trade secret. This section should include information on boiling point, vapor pressure, vapor density, solubility in water, specific gravity, percent volatile, evaporation rate, and appearance and odor. Sometimes, the pH is included for aqueous solutions. This section has information on the flammability of the product, on the types of fire extinguishers needed, and on other special precautions. This data is important when planning for emergencies. This section tells you about the product's compatibility with other chemicals, and special conditions to avoid. The stability of the product indicates whether the product can decompose and under what conditions. The incompatibility section tells you what chemicals can react with the product. This section is very important in determining what materials should not be stored near this product. Hazardous decomposition products tell you what hazardous chemicals can be produced when the product is heated or burned. The hazardous polymerization section tells you whether the product can polymerize, and under what conditions. This section should tell you the routes (skin contact, inhalation, ingestion) by which the product can affect you, the symptoms of overexposure, acute and chronic health effects, emergency first aid measures, and carcinogenicity. If the product, or chemicals in the product, has been found to be a carcinogen or probable carcinogen by the International Agency for Research on Cancer (IARC), or OSHA, or is listed in the National Toxicology Program's Annual Report on Carcinogens, then the MSDS must state so. The MSDS should also list medical conditions which could be aggravated by exposure to the product. This section covers such topics as spill control, waste disposal, storage and handling precautions, and other special precautions such as personal protective equipment needed for spills. Unfortunately, the section on waste disposal often just says to dispose wastes according to local, state, and federal regulations. This section should give you a lot of information about respirators, ventilation, and other personal protective equipment, but unfortunately, often does not. The respirator recommendations should state what type of cartridge should be used. The ventilation section should tell whether general mechanical ventilation (dilution ventilation) is sufficient, or if local exhaust ventilation is recommended, and if so, what type. This section should also list other recommended personal protective equipment such as gloves, goggles, and protective clothing. Unfortunately, most MSDSs do not tell you what type of glove to use. This article was originally printed for Art Hazard News, © copyright Center for Safety in the Arts 1992. It appears on nontoxicprint courtesy of the Health in the Arts Program, University of Illinois at Chicago, who have curated a collection of these articles from their archive which are still relevant to artists today.